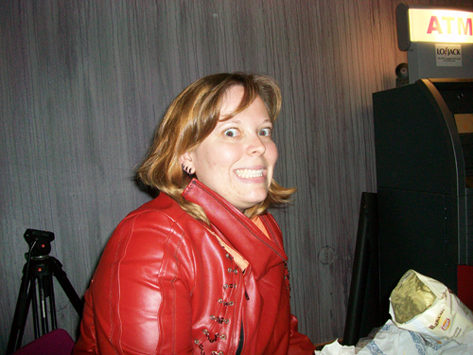 I keep typing First Fridays as First Friday’s…yeah I’m weird like that. But that’s not really the secret. The real secret is that I am going to be at First Fridays with my good friend Doctor Lunchbox! She’s pretty great, I’m tellin’ yah! She’ll be walking around and shmoozing with the people and I’ll be at my own little booth drawing comics live and in person while taking suggestions for comics and such. It should all be pretty smashing. I hope you all can come out and see us at Roosevelt Row! In other news, I’m not sure I have told you folks about my escapades with Paranoid Onion. On the 16th of February my fellow part-time mad scientists were participants of this hep new thing called Geeks Night Out. We were given a chance to table our geeky art thanks to Pop Culture Paradise, a lovely comic shop owned by two upstanding young gentle-nerds (I won’t name them in case they wouldn’t take kindly to it). It was good fun, and I have some loverly pictures for you all to view…that’s right folks, you will see my actual face. I hope it doesn’t ruin the magic too badly for you. 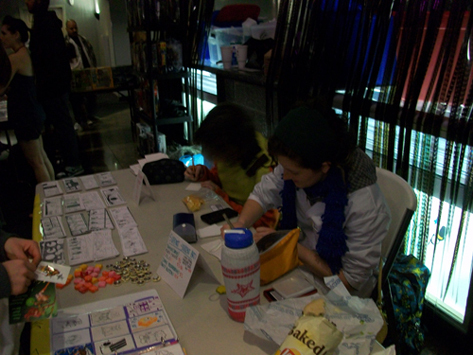 Here you are enjoying a lovely shot of Doctor Lunchbox and myself doodling up some sketch cards for the eager customers. We did get quite a lot of business. Our funds did get us several steps closer to repaying Dr. Mustard for purchasing our table at Comic Con. 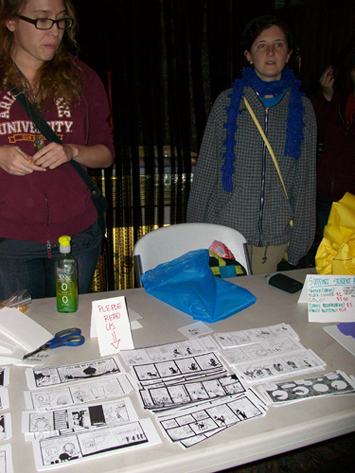 You may notice that Doctor Lunchbox and myself were selling bookmarks that have our strips on them. They were quite popular! You may also notice that I have that labcoat I was talking about earlier. When the coat is on, you will refer to me as Dr. Howdy Pilgrum. Here you have the lovely and terrifying Dr. Mustard. A good friend of mine and Doctor Lunchbox’s. She’s a very talented artist and got much praise for her fabulous sketch cards. 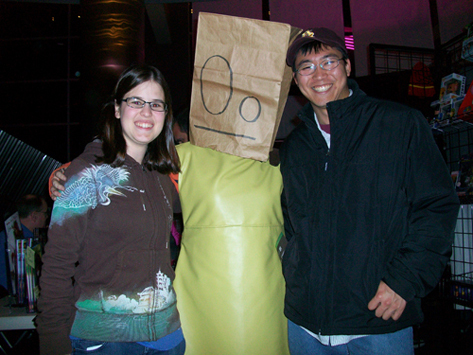 Finally, I wished to include this lovely shot of Doctor Lunchbox with some of her adoring fans. The outfit you see on her is the one she has on in her strip Rocket Science. It’s quite a funny strip. You can view it as well as Boy’s Cat on the State Press website and newspaper. I hope you all enjoyed this little adventure. I know I had a sweet time, and am very grateful to Pop Culture Paradise for their kindness and enthusiasm. Have a great night everyone, I’m off to work another night at Gammage!